Marketplace | Marketplace – Predictive Aviation Analytics Inc.
Predictive Aviation Analytics offers the best cost and safety predictions for airplanes. Using existing airline sensors and data from the Flight Data Recorders (FDR) its software more accurately predicts outlying indicators before they become problems. Predictive Aviation’s unique artificial intelligence software, “learns” as it gathers more information. It used only 1.33% of the data available to the current leading predictive models (FDM/FOQA models) and still outperformed them by up to 70%. The more data it gains, the more accurate it will become. Commercial, Military and General Aviation will all benefit from Predictive Aviation. They will see their safety record improve, their customer satisfaction grow, and their maintenance costs substantially decline. Even a single plane has a huge impact. The Boeing 777 had been in the air for 13 hours on its way to Dubai. It had just come out of routine “A Check” 125 hour inspection. The smooth ride had no irregularities. Then, shortly before landing, the Captain saw needle fluctuations in the N2 gage. No one saw that the N2 needle had been displaying imperceptible and increasing vibrations over the last 50 hours. The Captain continued to monitor the needle. It stayed in the green until they landed. As they taxied, the fluctuations spiked into the red. The pilot shut down the engine and immediately radioed maintenance. Dubai had no spare 777 engine. Reroute passengers to other airlines and Potentially lose future business from passengers who experienced travel disruptions and delays. Fly in a Boeing 777 spare engine, maintenance team and test pilots. Lodge and feed the crew, maintenance team and test pilots until the aircraft could fly again. Add a second Boeing 777 to fly the daily Dubai route for the duration of the repairs. Over 31,850 commercial aircraft currently fly the world skies. 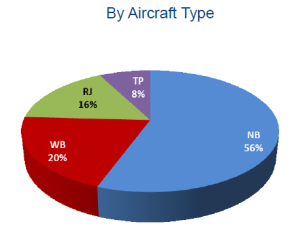 General Aviation (GA) flies an additional 360,000 planes with 58% of those flying within the USA. In 2013 revenues totaled $819.4 billion for commercial and GA combined. The industry continues to grow at a rate between 1.5% and 2.5%. The Maintenance, Repairs and Overhaul market (MRO) takes care of the upkeep of the fleet. It costs $131 billion annually to keep the fleet safe and running. 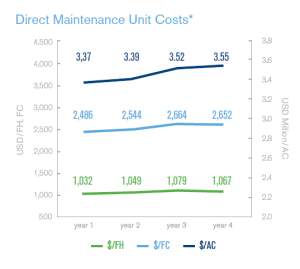 Below is a chart that breaks down this cost into maintenance cost per flight hour (FR), per flight cycle (FC) and per aircraft (AC). Engine maintenance uses 42% of the budget. And billions are spent on spare parts inventory—about $3.1 million for each commercial aircraft. The International Air Transport Association (IATA) estimates the average age of the world wide fleet at 10.9 years. So maintenance and prevention are ongoing concerns. Predictive Aviation taps into this large market. It offers airlines a chance to fix some failures before they emerge into full-blown problems. The company will focus first on global commercial aviation. Using current technology, 20 % of failures are time based. The remaining 80% of failures happen randomly and cannot be effectively correlated to time or operating hours. Predictive Aviation’s technology seeks to identify those random 80% of failures so they can be effectively correlated to operating hours. This brings increased safety and cost effectiveness. Airlines continue to look for ways to reduce their costs and increase safety. Predictive Aviation is well positioned to profit as it helps airline companies do just that.